Action: Name a card. Your opponent reveals his hand. 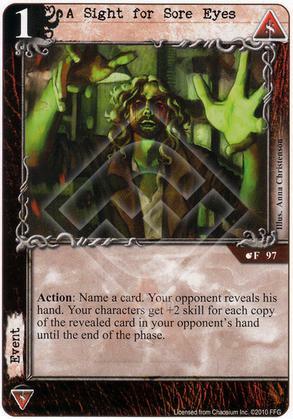 Your characters get +2 skill for each copy of the revealed card in your opponent's hand until the end of the phase. 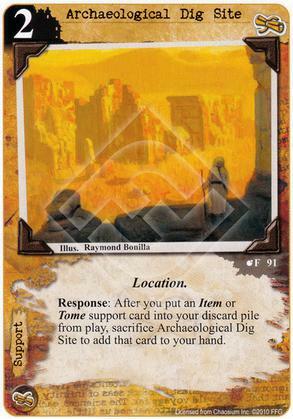 Response: After you put an Item or Tome support card into your discard pile from play, sacrifice Archeological Dig Site to add that card to your hand. Action: Choose a story. Add or remove a (C) struggle from that story until the end of the phase. 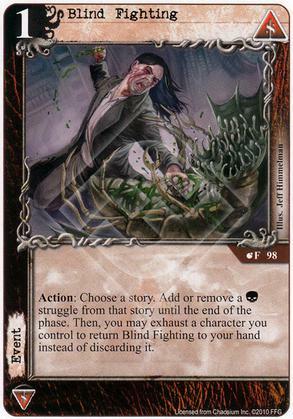 Then, you may exhaust a character you control to return Blind Fighting to your hand instead of discarding it. If it is Day, Border Patrol Guard gains (C)(C). 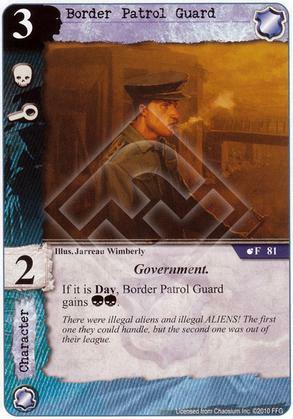 There were illegal aliens and illegal ALIENS! The first one they could handle, but the Second one was out of their league. 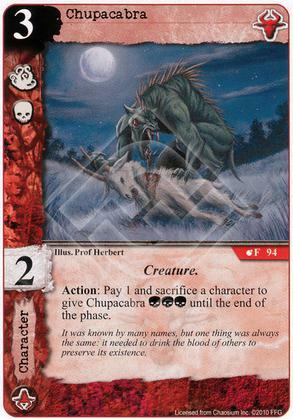 Action: Pay 1 and sacrifice a character to give Chupacabra (C)(C)(C) until the end of the phase. 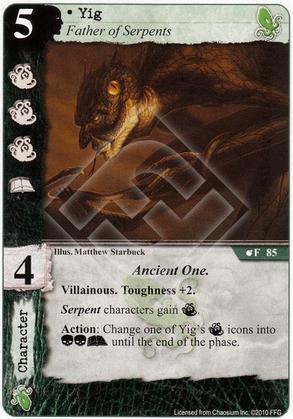 It was known by many names, but one thing was always the same: it needed to drink the blood of others to preserve its existence. 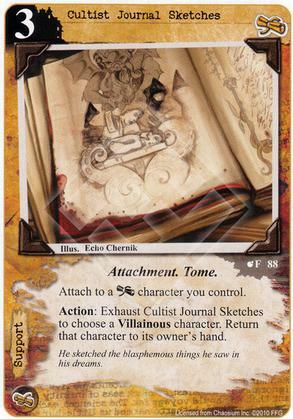 Attach to a [Miskatonic University] character you control. Action: Exhaust Cultist Journal Sketches to choose a Villainous character. Return that character to its owner’s hand. He sketched the blasphemous things he saw in his dreams. 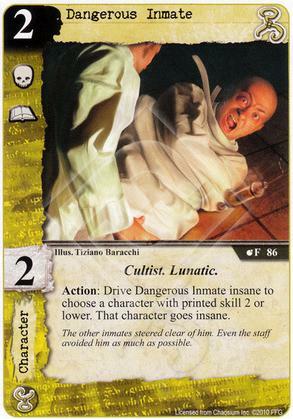 Action: Drive Dangerous Inmate insane to choose a character with printed skill 2 or lower. That character goes insane. The other inmates steered clear of him. Even the staff avoided him as much as possible. 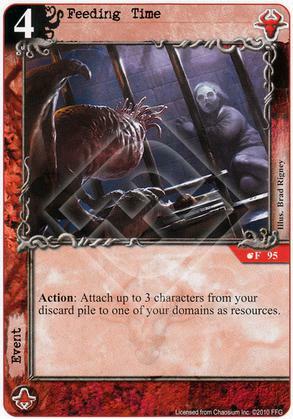 Action: Attach up to 3 characters from your discard pile to one of your domains as resources. 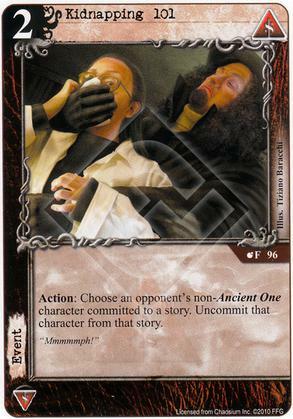 Action: Choose an opponent’s non-Ancient One character committed to a story. Uncommit that character from that story. Each of your characters committed to this story gains Fast. Action: Exhaust M.U. 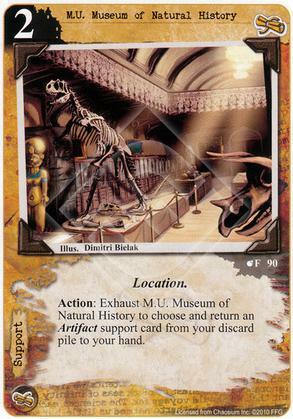 Museum of Natural History to choose and return an Artifact support card from your discard pile to your hand. 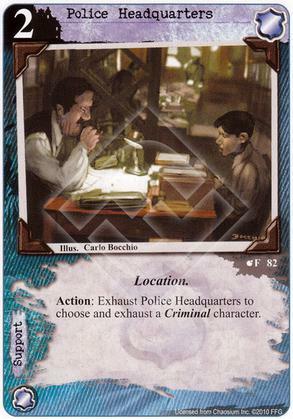 Action: Exhaust Police Headquarters to choose and exhaust a Criminal character. 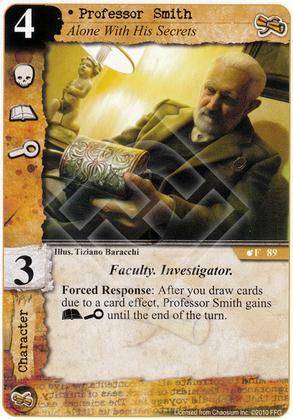 Forced Response: After you draw card due to a card effect, Professor Smith gains (A)(I) until the end of the turn. 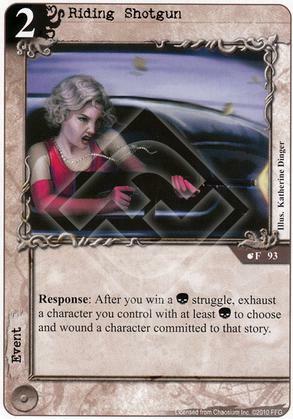 Response: After you win a (C) struggle, exhaust a character you control with at least (C) to choose and wound a character committed to that story. 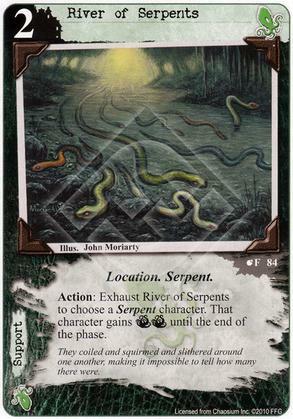 Action: Exhaust River of Serpents to choose a Serpent character. That character gains (T)(T) until the end of the phase. They coiled and squirmed and slithered around one another, making it impossible to tell how many there were. 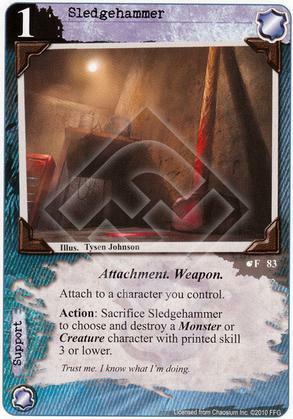 Action: Sacrifice Sledgehammer to choose and destroy a Monster or Creature character with printed skill 3 or lower. 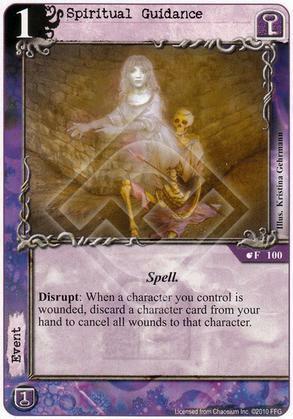 Disrupt: When a character you control is wounded, discard a character card from your hand to cancel all wounds to that character. 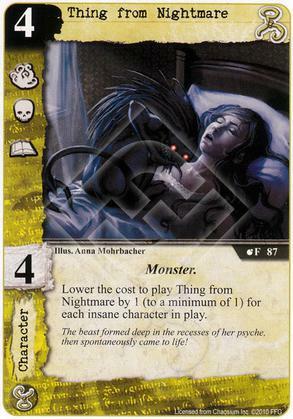 Lower the cost to play Thing from Nightmare by 1 (to a minimum of 1) for each insane character in play. The beast formed deep in the recesses of her psyche, then spontaneously came to live! Action: Change one of Yig’s (T) icons into (C)(C)(A) until the end of the phase. 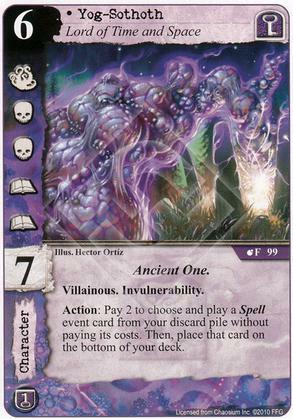 Action: Pay 2 to choose and play a Spell event card from your discard pile without paying its cost. 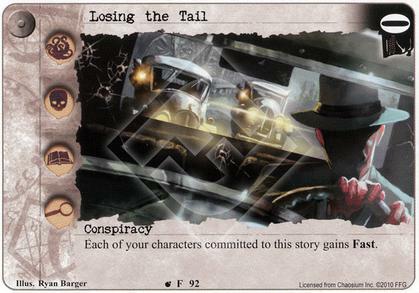 Then, place that card on the bottom of your deck.